ISIS is a well organized political movement, not a religious one. The 2003 U.S. invasion of Iraq, which destroyed institutions and created disorder and disaffection among the Sunnis, led to the creation of these extremist groups. The (Un)Islamic State in Iraq and Syria was the title of a speech delivered today by Dr. Pete Moore, Associate Professor of Political Science at Case Western Reserve University, at University School's 12th annual George E. Spencer III Lecture Series. The lecture honors George "Twig" Spencer III, the only known University School alumnus (class of 1969) to perish in the terrorist attacks of September 11, 2001. Geoffrey Spencer, University School class of 1975, along with family members, classmates, and friends, established the annual lecture series in honor of his late brother to pay tribute to him and to enhance awareness and knowledge of international relations, tolerance and understanding. 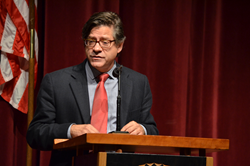 Addressing over 400 students, faculty, and guests at the school's Hunting Valley Campus, Dr. Moore, who is Director of the Northeast Ohio Consortium for Middle East Studies, discussed ISIS, the terrorist organization of Islamic extremists and their influence in Iraq and Syria. Dr. Moore described the group as a militia for local defense that is funded through oil and organized crime to yield power. He said the group holds control over the main roads from Jordan and Syria into Iraq through extortion. As the descendants of al-Qaeda in Iraq, Dr. Moore said the group did not arise out of a vacuum, but rather through decades of war and sanctions. “The 2003 U.S. invasion of Iraq, which destroyed institutions and created disorder and disaffection among the Sunnis, led to the creation of these extremist groups,” he said. “Many of the individuals in ISIS are former resistance commanders who worked for Saddam Hussein.” The U.S. withdrawal from Iraq and the ongoing unrest in Syria have contributed to ISIS’s rebirth. While Dr. Moore acknowledged that there are no easy solutions to the combating the Islamic State in Iraq and Syria, he believes that the United States should engage in more serious conversations with Iran to root out the extremist group.